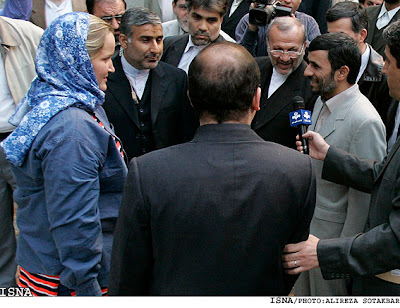 Ahmadinejad meets the Brits including Faye Turney after she was given a hijab, of course! Ahmadinejad asked Blair not to prosecute the sailors for going into Iranian territory. Ahmadinejad says he is offering a ‘gift’ to the British on the birthday anniversary of the Prophet of Islam and the Prophet Jesus’ ascension to the Heaven. Mahmoud awarded a medal of honor to the Revolutionary Guards commander who captured the British sailors and marines in Iraqi waters. Iran says they will release the 15 British hostages! TEHRAN, Iran — Fifteen British sailors and marines seized by Iranian naval personnel have been pardoned and will be freed, President Mahmoud Ahmadinejad said at a press conference Wednesday, but he vowed his country would not tolerate invasions of its borders by any country. 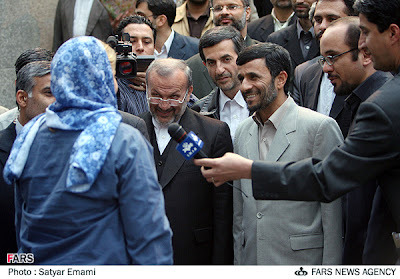 “I announce that the great people of Iran and the Islamic Republic, even having legal rights to try these military people, in honor of the prophet’s birthday, will be freed as a gift to the people of the United Kingdom,” Ahmadinejad said in a speech to reporters, clerics and civil servants in a small hall in Tehran. 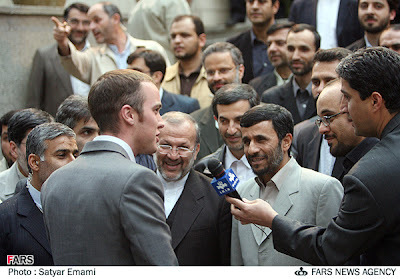 In response to a reporter’s question, Ahmadinejad said the British troops would be freed at the end of the press conference. Prime Minister Tony Blair’s office said it “welcomes” the news that troops would be freed. 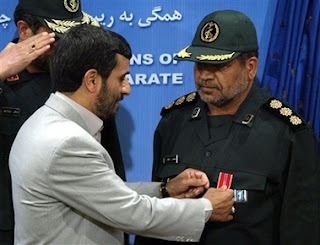 Ahmadinejad interrupted his speech to pin a medal on the commander of the Coast Guards involved in capturing the British personnel in the northern Gulf on March 23. Two other Coast Guards came on to the podium and saluted during the ceremony. Free the Navy 15 Blog had planned a rally in London today… check for updates. HotAir has video of the press conference and a big roundup including that the US is allowing the Iranian regime to meet with their captured diplomats. Captain’s Quarters says that CENTCOM has no evidence of the Iranian meeting with the 5 detained diplomats. Sister Toldjah notes that Ahmeanie threw out a few jabs during his talk. Prairie Pundit thinks something is backwards. RedState says the Iranians knew the Brits would cave and they were right RedState also investigates the capture. Pajamas Media has a roundup. Thanks for the cheesy sweatsuits! Publius Pundit sees this as a well orchestrated publicity stunt. Iran Captures 15 British Sailors in Iraqi Waters! Iranians Force Confessions… Transfer Captured Brits to Tehran! Democrats Refuse to Support British Hostages!! After Prayers… Iranian Protesters Attack British Embassy! Pelosi & Dems Abandon Captured British Sailors & Marines!